Until recently, when the Vancouver 2010 Olympics showed the world that Vancouver weather is capable of 10°-15° C in February, Canada was thought of globally as a “cold place”. In fact in Vancouver, the temperature rarely dips below freezing. Snowfall, while possible is seldom and largely gone after a few days of milder temperatures. 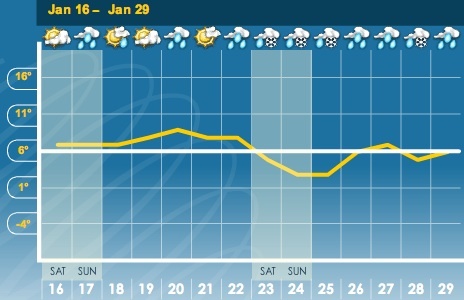 The diagram to the left has not been altered in any way, it’s the fourteen-day forecast for Vancouver in late January, 2010, the beginning of the second semester of w88Việt nam SFU’s Full-Time MBA program. Even though it threatened to snow a few days that week, the temperature didn’t ever fall below 5°, and there wasn’t much more than a sprinkle of rain. Read on for more info about typical Vancouver weather and activities. Vancouver’s weather profile is indeed considered Mediterranean, however admittedly the summers aren’t necessarily always hot and dry, often they’re interspersed with days of rain or overcast skies. When Vancouver is gorgeous and sunny, in the summer months when the temperature is between 25°-30°, it is absolute paradise. As a matter of fact, since these are the months that the coursework for the Full-Time SFU MBA is winding down, and internships are beginning, I highly recommend that students get as much work done before these gorgeous days start becoming more frequent. Vancouver boasts over 50 kilometers of beaches and is an outdoor adventure mecca, with hiking, cycling, kayaking, rock climbing, yachting, etc, all within easy access. If you’re interested in going to business school full-time, while continuing to have a life full of activities and fun, Vancouver is the perfect place to do it. The SFU Full-Time MBA program at SFU consists of three semesters, with three months of studying, followed by a one-month break. The program is exactly 1 year long, with a 4-8 month paid internship following the completion of the coursework. Students, for the majority of these breaks will spend most of their time recovering from the intensity of the past 3 months of 8-10 hour per day studying. 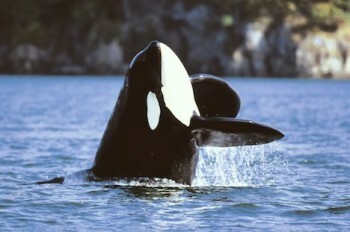 During this time, beautiful British Columbia and the Pacific Northwest is at your fingertips. On one such semester break, a group of international students took a ferry to Vancouver Island to enjoy the scenery and go whale watching. Rumor has it that they saw something very similar to the picture here. I’m sure that beyond the MBA rankings and the average salary for graduates, potential MBA students focus on the location in which they’ll be spending the time it takes to complete their Graduate Business Degree. 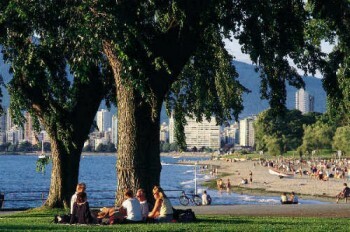 I think Vancouver represents one of the most desirable and student-friendly cities on the world. I definitely suggest that if you aren’t already, you should be looking at Vancouver as a place to study for your MBA. Oh ! nice blog. I’m curious to visit Vancouver to experienced there nature and since Vancouver represents one of the most desirable and student-friendly cities in the world. I want to prove it,someday.